SHAIKH MUHAMMAD IQBAL, reverently called Allama Iqbal, was one of the greatest eastern poets and philosophers of the twentieth century. He represents the beginning of a new age, a new search for values and forms, both of poetry and life. To the common Indians he is better known for his Tarana-i-Hindi  Sare Jahan se achchha Hindostan hamara. Muhammad Iqbal was born on November 9, 1877, in Siyalkot. He was a descendant of the Brahmins of Kashmir. He studied philosophy and law at the Cambridge university (England) and the university of Munich (Germany). He finally made Lahore his home where he lived up to his death, on April 21, 1938. Iqbal had a good command on Urdu as well as Persian and he composed verses of unprecedented beauty in both languages. His ability to express himself poetically brought him instant recognition. In Urdu poetry, he is considered second to none but Mirza Ghalib (1797-1869). Comparing the two, Professor Muhammad Mujeeb, the author of Indian Muslims, opines that whereas Ghalib represented the consummation in literature of the ideal of wahdat al-wujud, (the Unity of Existence), Iqbal exploited to the full the religious and aesthetic possibilities of the other tradition, wahdat al-shuhud (The Unity of Phenomena). In his Persian poetry, Iqbal was greatly inspired by the poetic genius of the renowned thirteenth century mystic Maulana Jalal al-din Rumi. His major Persian works are: Asrar-i-Khudi (The Secrets of the Self), Ramuz-i-Bekhudi (The Secrets of Selflessness), Zabur-i-Azam (Psalms of Persia), Javid Namah and Payam-i-Mashriq (Message of the East). Iqbal also presented a summary of his philosophical ideas in a series of seven lectures in English. These lectures, explaining the Islamic philosophy in terms of modern philosophy and science, were later published under the title  The Reconstruction of Religious Thought in Islam. During my visit to Lahore, I had a keen desire to pay homage at the tomb of this great poet. As I was staying in the Gurdwara of Guru Arjun Dev, popularly known as Dera Sahib, I did not have to go for in search of the memorial. It is situated at a distance of a few minutes walk, to the left of the majestic gateway of the Badshahi Masjid, opposite the Lahore Fort. 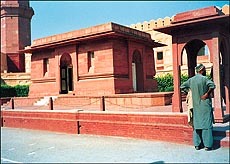 On the exterior, this red sandstone monument is an austere building. It was designed by Nawab Zain Yar Jang Bahadur, the chief architect of the Hyderabad state, keeping in view the decision that the mausoleum "should aim at the expression in stone of the self (khudi), its tenacity and power." For we have been brought up during one and the same spring. For in the times of need our ancestors have done the same. The interior walls of the building also bear some floral and geometrical designs carved over them. Interestingly, the construction of the monument was financed not by any ruler or government, but by contributions from the poets friends, disciples and admirers. In Pakistan the anniversary of the poets death is observed each year as Iqbal Day.